Albury Hotel is a 38 room boutique hotel in Key West*s historic district. Located near the harbor; it is within walking distance of Key West*s major attractions including restaurants; shopping and nightlife; waterfront activities; and quaint island neighborhoods. This boutique hotel offers a variety of guestrooms; from economy to luxury. 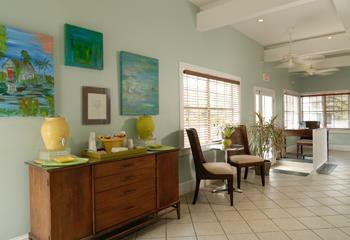 Guestrooms are located in several historic buildings; each with typical Key West architecture. Continental breakfast is included with all guest stays. There is a cocktail pool with waterfall in the main courtyard. Located in Key West's Historic District, at the corner of Eaton and Frances Streets, the hotel is one block from Key West's Harbor, and a short walk from Duval Street and Mallory Square. The surrounding area includes Historic neighborhoods, restaurants, shopping, water activities, and nightlife. There are no dining facilities on-site, but many restaurants and shops are located within walking distance of the hotel. The hotel is located in Key West's primary entertainment district. Nearby attractions include beaches and water activities, the harbor, museums, galleries, shops, restaurants, Duval Street, nightlife, etc.